10' Miller Reversible Plow with John Deere hook up. Model ASNB. Overall height 41". Monroe 11' Mild Steel Reversible Plow with MC6000 Hitch. Overall Height 42". Full Moldboard Trip Model. Meyer 9' Heavy Duty Poly Straight Blade Plow. Complete with Used mount, wiring, and control for 2008-2016 Ford F250-550. Installation Available. 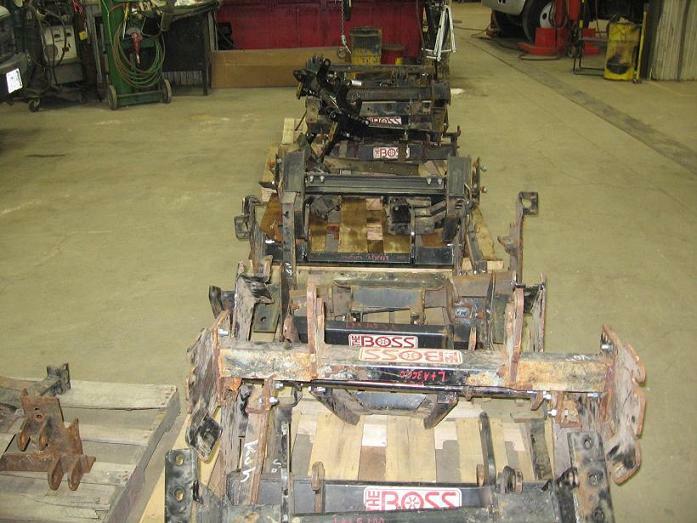 Boss EXT 8'-10' Expandable Plow. Complete with Used Mount, Wiring, and Control. Installation Available. Boss 9' Steel Trip Edge Plow with Snow Deflector. RT3 / SH2 Attachment System. New Cutting Edge. Complete with Used mount, wiring, and control. Installation Available. Fisher 9' Steel Straight Blade Plow. Minute Mount II, Snow Deflector, Skid Shoes. Complete with Used mount, wiring, and control. Installation Available. Used Very Little, Nice Condition! Hiniker 8' Steel Straight Blade Plow. QH1, Black Harness. Complete with Used mount, wiring, and control. Installation Available. Boss 9'2" XT Steel V-Plow Plow with Snow Deflector and Back Drag Kit. Complete with Used mount, wiring, and control. Installation Available. Nice Condition. Western 8'6" Ultra 3 Steel Straight Blade Plow. Complete with Used mount, wiring, and control. Installation Available. Western 8' Uni Mount Poly Straight Blade Plow with Ultra/Uni Conversion. Snow Deflector. Complete with Used mount, wiring, and control. Installation Available. Pro-Tech 12' Loader Model SP12L Rubber Edge Sno Pusher. Approx. weight 2200 lbs. Snow Capacity 15yd. For use with 100-110 HP Loader. Used Boss, SnowDogg, Fisher, Western & Hiniker Mounts. Call Parts/Sales at 800-722-0588 regarding price and availability.